It's here! The highly anticipated Simpsons World portal is open for your entertainment. Go forth and browse all 552 episodes, find and share clips, and use the impressive search function to look up every single appearance of Sideshow Mel. But wait, there's more! Cable subscribers with the FXNOW app will have on-demand access to all 25 seasons plus episodes from the current season the day after they air. 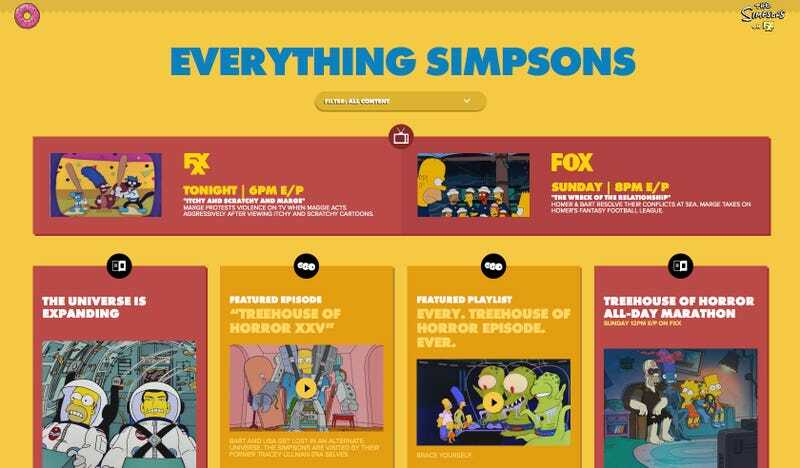 "Simpsons World is designed so that users are immediately immersed in the show as soon as they open the app: it's just playing," says Allen Orr, group creative director at Huge, which collaborated with FX on the app. And this is only the beginning, says Dennis Steir, Huge's associate creative director. "There are a lot of great features that will roll out over the next year that will be all about immersing yourself in The Simpsons on a whole new level." Hurry, get thee to Springfield. Update: Folks are reporting that the site is slow and the FXNOW app is also having trouble. We'll chalk it up to launch day and I'll take a deeper look when it's running at full speed.